LONDON — Rafael Benitez succeeded in his gamble of staying on as manager as he steered Newcastle United straight back up to the Premier League with a 4-1 win over Preston on Monday. The former Liverpool, Chelsea and Real Madrid boss stayed on after they were relegated to the Championship at the end of last season and even though Newcastle stumbled of late, the victory over Preston guaranteed a top two finish. The Magpies became only the seventh team out of 18 to go straight back up in the past six years. They will join Brighton -- who were assured of promotion to the Premier League for the first time last Monday -- in the top tier next season. 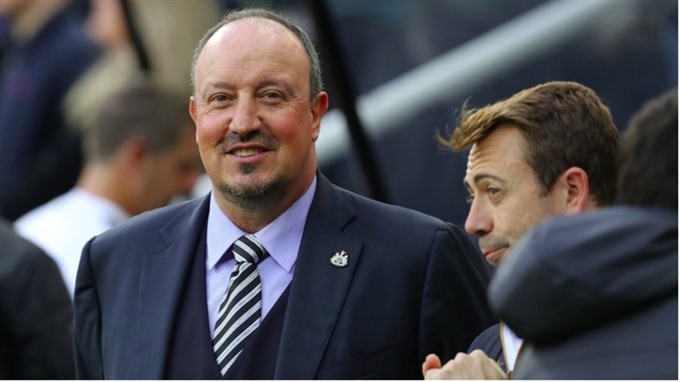 For 57-year-old Benitez there was a glimmer of a smile at the end -- although he is not one known for wearing his heart on his sleeve -- and a qualified response as to whether he would remain with the club. He was known not to be satisfied at the lack of investment in players in the January transfer window. "I think I will have to analyse a lot of things, but I’m really pleased here," he told Sky Sports. "So hopefully we can do what we have to do to be stronger in the Premier League." Benitez said it had been a tough old battle and the heat of competition had been intense. "It wasn’t easy at all," said Benitez. "You have seen a lot of teams in this competition knew what to do. "We had to fight from the start and played some very good football sometimes, some not so good at times, but in the end we go up. "I think from the last day of the last season, I wanted to show my loyalty to everyone here." A crowd of just over 50,000 had endured a nervy first-half as the Magpies once again looked tense -- just two wins in their last eight games when they had looked like cruising back to the top flight had set nerves on edge. Things had looked on course for an easy passage when Spaniard Ayoze Perez scored in the sixth minute -- although there were suspicions of the ball going in off his arm. However, the visitors levelled soon afterwards with a stunning goal from Jordan Hugill, who nonchalantly flicked Tom Barkhuizen’s cross into the net for his 12th Championship goal of the season. The hosts floundered for most of the rest of the half with the massed ranks of spectators going quiet. That was until Christian Atsu, on loan from Chelsea, awoke them from their torpor as he tucked the ball home in the 45th minute. Doubts still lay in the back of the fans’ and players’ minds but they were dispelled in dramatic fashion in the 64th minute as Paul Gallagher handled on the line and was sent off -- the reliable Matt Ritchie tucked away the penalty and ran to the Newcastle fans to celebrate.